From online engagement with patients to streamlined electronic hospital records, digital solutions are the future of the medical landscape. This infographic released by CMI illustratees how the pharmaceutical industry can keep pace with innovation and take advantage of the latest tech offerings. 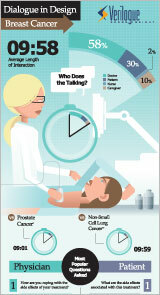 How long is the average breast cancer physician-patient conversation? How is the conversational time split up between patients, physicians and caregivers? What are the top questions asked by patients? By physicians? How does the breast cancer conversation compare to other tumor types? This infographic from Verilogue draws insightful conversational insights from its collection of real breast cancer exam room interactions. Technology is changing healthcare for patients, providers, payors and government. This infographic from Xerox depicts the impact of mhealth, health insurance exchanges, meaningful use requirements and the increasing availability of ‘big data’ on the healthcare industry. Do incentive programs work in healthcare? History has shown that incentives can reward loyalty and engage participants. 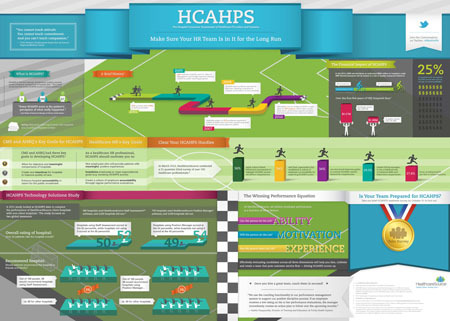 This infographic from API Healthcare illustrates the need for incentives in healthcare and the psychology behind them. A Google infographic illustrates what influences hospital selection and the role digital plays in the journey to wellness. Google partnered with Compete, Inc. and fielded over 500 hospital researchers to understand what influences hospital selection. Commercially insured scheduled admissions are the largest contributor to inpatient margins for the average U.S. hospital. During the U.S. recession (2009-2011), volumes in this segment declined, as shown in this infographic released by Objective Health. There were two primary drivers of this decline, notes Objective Health. First, commercial insurance coverage decreased, stemming from unemployment and underemployment. This is expected to reverse and rebound as the economy recovers and as healthcare reform is implemented. Second, even among those who retained coverage, utilization of inpatient services decreased as patients delayed or forewent elective and preventive care. This was influenced by a range of economic factors, including reduced household incomes, higher co-pays, and a reduced ability to leave work for medical care, as well as factor unrelated to the recession, such as a shift to outpatient management of disease. It is unclear whether this second driver will diminish fully as the economy recovers. A slow recovery  or one that fails to see volumes to return to pre-recession levels  suggests that hospitals may need to refocus their strategies on service lines and segments that have historically been less attractive. To determine the coachee’s values, the health coach listens to achieve empathy and understanding, which demands that they have a sense of an individual value, says Kelly Merriman, vice president of service delivery at HealthFitness. Prior to their presentations during a September webinar on Integrated Health Coaching: The Next Generation in Health Behavior Change Management, Merriman and Dr. Dennis Richling, chief medical and wellness officer at HealthFitness, discussed HealthFitness’ transition to a population health management focus, why HealthFitness’ coaches target the chronic disease population and a new coaching tool called appreciative inquiry. HIN: How has HealthFitness’ shift from a disease management to a population health management focus meshed with the industry’s post-reform models of care, for instance the patient-centered medical home (PCMH) and the accountable care organization (ACO)? (Dr. Dennis Richling): HealthFitness has had a population health management focus for many years and we see that many of the same principals that we use in our approach are included in ACOs and in medical home models. Recently, we took a new look at disease management, which traditionally has been a stand-alone service, largely focused on patient self-care issues separate from lifestyle coaching interventions. In our new model, health behaviors across the entire risk continuum are dealt with in a person-centric way, rather than a disease-centered approach. That of course aligns with some of the principles of the post-reform models of care, like the medical home, and even to some degree with ACOs, which are attempting to be responsible for the total healthcare picture of a population. HIN: In your company’s three-tiered coaching across the continuum approach, where do most of the coaching candidates fall? (Dr. Dennis Richling): In every population you find different numbers, but in a typical employer, we see that the greatest opportunity for coaching is in those individuals who have behaviors that can lead to chronic disease. A good example of an ideal candidate for our coaching program is a 40-year-old manager working 50 hours a week. His blood pressure isn’t high, his cholesterol is slightly elevated and he’s a little overweight. He doesn’t exercise regularly and while he tries to watch his fats, he isn’t eating the most healthy diet because he hasn’t figured out how to balance his work schedule and his family life, and being 40. He’s also at risk for chronic disease. If he adopts more healthy behaviors, he can avoid developing a chronic disease. Then there are those who already have a chronic disease like diabetes or coronary artery disease. This is about 10-20 percent of a population, depending on the population we’re looking at. Instead of putting all of them into nurse coaching, like traditional disease management, we determine through claims and a short assessment if the disease is well managed. In our experience, about three-quarters of those with chronic disease are taking their medicines and managing their diseases relatively well, though, they still need help with the underlying lifestyle issues that led to the chronic disease. Those individuals are matched with an advanced practice coach (APC) who understands their underlying chronic disease issues, but will work with them to achieve goals that they want to work on, like losing weight or exercising regularly. By far the smallest group is those with the newly diagnosed or uncontrolled chronic disease. We match them with nurse coaches who can most effectively work with their self-management approaches, with making sure that they follow their medication and care plans that the physicians have prescribed. HIN: In tailoring a coaching program to the individual, how does a coach determine the coachee’s values? (Kelly Merriman): We call it ‘listening until you don’t exist.’ Most people listen to get information or because they enjoy the process of exchanging perspectives. Our coaches listen to achieve empathy and understanding, which demands that they have a sense of an individual value. For example, Michelle is 46 years old and is significantly overweight. And because of her weight, she’s a pre-diabetic. She told her coach that she was ready to make a change. She knew her weight wasn’t only impacting her health, but also her self-esteem. Michelle’s coach listened and learned that she took pride in being a pillar of support for family and friends, that ‘never let them see you sweat’ mentality, which meant she was holding in her fears of being overwhelmed at times. Imagine if a coach reflected back thoughtfully and said, “I’m hearing, Michelle, that you take pride in caring for others, that you value being competent and having others rely on you for support. And sometimes when things get to be a little too much, you overlook your own health.” Once a coach finds those values, they’ve got something to work with to promote hope and inspiration. It’s what we call motivation. HIN: Could you provide some details on appreciative inquiry and perhaps describe a scenario in which a coach might employ this tool? (Kelly Merriman): All too often when people want to change a behavior, they tend to focus on all the negatives. All the attention goes to focusing on what’s broken. That focus can hold a participant back from achieving their goal. Our coaches use appreciative inquiry to focus on the participant’s strengths instead. The appreciative inquiry approach deliberately seeks to discover that person’s exceptionality, through their unique gifts, strengths and qualities. We listen with intent to appreciate who they are during the early coaching interactions and then envision how they want their life to be. Appreciative inquiry has low resistance as an approach to change because it builds upon the person’s positive core, the things that they already have going for them. It assumes that tapping into their positive experiences and strengths are useful in discovering their intrinsic motivation to change and development. This immediately shows the coach and the participant that they have faith in the ability to make a positive change. As an example, let’s look at Michelle again. We want to appreciate what she’s got going for her and use that to help her to envision what her future may be. Michelle is overweight, pre-diabetic and feeling overwhelmed. Her coach learned that she’s committed to her health, takes pride in being a pillar of support for her family and friends and is organized and creative. Instead of focusing immediately on fixing what’s broken, that she eats too much between meals and doesn’t exercise enough, her coach focuses on envisioning Michelle’s idea of health, one that honors her strengths and her values. In this case, Michelle’s vision of health may be using her creativity and strengths of purpose to take care of her own self as well as the people she loves. She’ll make healthy choices, will see the results, and have the freedom to live the life she wants. The healthcare industry is getting all the more mobile-empowered with the advent of technologies like Wi-Fi, RFID and NFC etc. This infographic on mHealth from xCube Labs discusses the trends involving mobile apps and devices and solutions that encompass adoption, opportunities, ecosystem and the future of mobile healthcare. The infographic also takes a look at consumer perception towards this expanding industry, with many using mHealth to obtain convenient access to their doctors and to reduce out-of-pocket expenses.